Why Did 60,000 Antelope Drop Dead Over Four Days? When 60,000 critically endangered saiga antelope dropped dead in central Kazakhstan in June, it had to have been a major bummer for the veterinarians who had just arrived to study the herd. Those wildlife vets have since become detectives, trying to unravel an Agatha Christie-worthy puzzle. Now they think they have a culprit, but it’s a baffling one. According to a new report by Live Science, harmless gut bacteria seem to have done the saiga in. As the dieoff ran its course over several apocalyptic days, field workers were on the ground taking environmental samples and conducting necropsies. An extensive analysis has since revealed that toxins produced by Pasteurella and possibly Clostridia bacteria caused extensive bleeding in the animals’ organs. Pasteurella is a typical gut bacteria found in saigas and other ruminants, and it shouldn’t cause harm unless the animals have weakened immune systems. Some strains of Clostridia do cause disease, but genetic analyses have only turned up the harmless, garden variety bugs. Clearly, something else seems to have happened for normally benign bacteria to wreak so much havoc. One possibility, according to wildlife vet and lead investigator Steffen Zuther, is that an exceptionally cold, hard winter, followed by a very wet spring caused the bacteria to become widespread in the environment. Perhaps herd immunity was also weakened this year, by an environmental cause not yet determined. It’s worth noting that many animal populations fluctuate in regular “boom and bust” cycles. For instance, the population density of Canadian snowshoe hares will rise and fall up to 25 fold over the course of 8 to 11 years. A report published in 2009 in the Journal of Animal Ecology found stress — whether from predation, disease, or food scarcity — to be the underlying cause. It’s possible that saiga have also evolved to weather cyclical dieoffs. 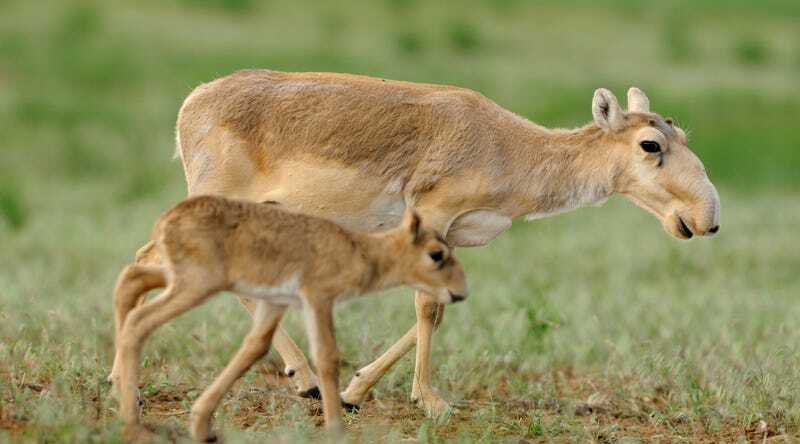 As Live Science notes, there have been several population crashes in recent decades, including a famous 1988 event that claimed 400,000 saiga lives. At the time, researchers attributed the dieoff to Pasteurellosis — a disease caused by Pasteurella bacteria — and performed no further investigations. But whether this is natural or not, there’s reason to be worried. As of 2014 there were only 257,000 saiga remaining on Earth. Since June of 2015, that number has dropped by half (during the demise of the 60,000-strong herd, smaller population crashes were occurring elsewhere in Kazakhstan.) It isn’t clear that the species can take many more hits.